From time to time, a Portal may need to be manually installed. To ensure successful Portal operation after a manual install, verify that the settings described below are applied to any manual installation. Proceed with the Portal website installer normally. 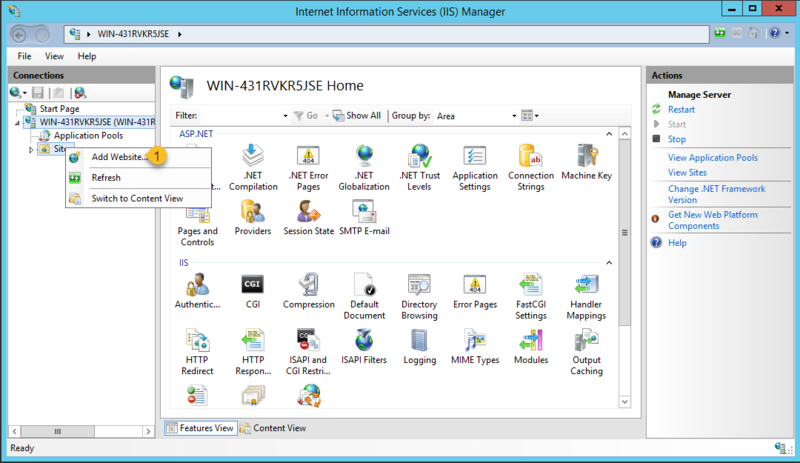 At the “Choose Components” step, un-check “Configure IIS Website” and complete the installation. This step is the same for all Portals and the B1WebAPI. Alternatively, you may manually copy web files into the desired folder. Fill in website details (Site name, Physical Path and Port). Note the default port and folder settings for each Portal in the table below. Fill in website details for your manual installation. 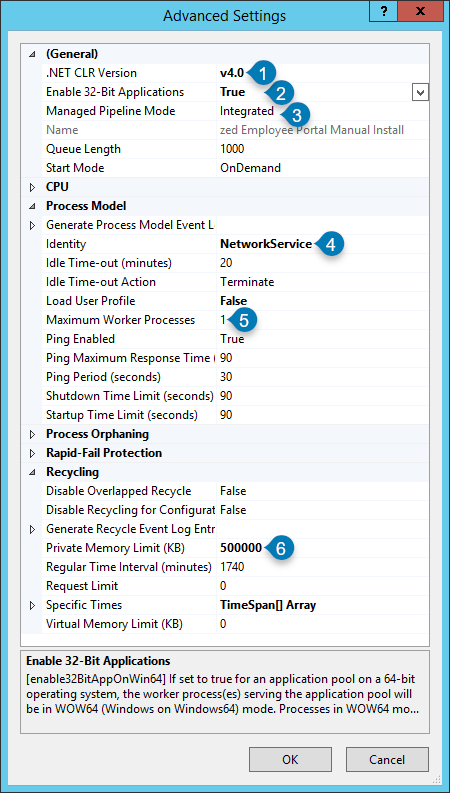 Configure the application pool, as shown in the screenshots below, taking note of the marked fields. Right-click on the application pool and open Advanced Settings. 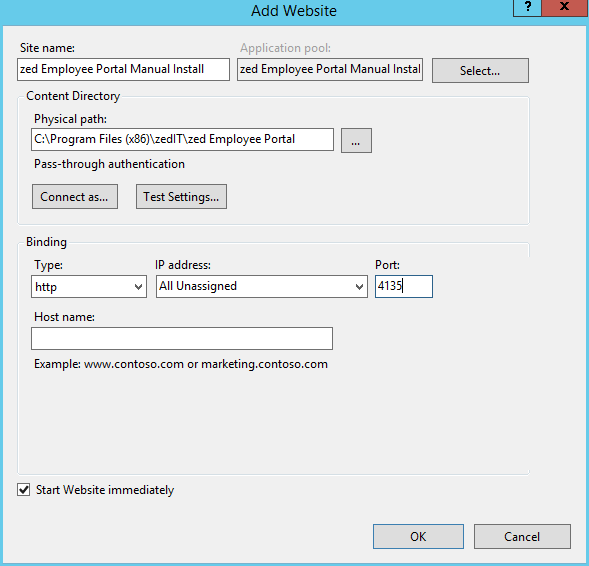 Application Pool settings for Portal websites. Make sure to set the marked fields as shown. Note: Marker 5 shows Max Worker Processes for any Portal (1 worker process). B1WebAPI should have 2 worker processes. If you copied the web files manually, update the web config so it points to the correct B1WebAPI details. To do this, open the website’s web.config file and update the b1clientenabler section to use the correct B1WebAPI host, username and password. 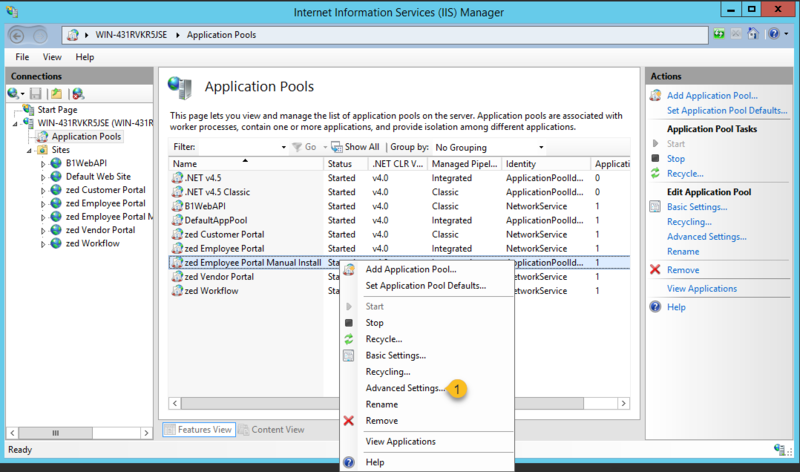 Using the IIS Application Pool “Identity”, ensure the appropriate write permissions are assigned to the application folders. Typically (but not always) this is NETWORK SERVICE. See each Portal’s installation guide for detailed steps. A quick reference is shown below. In addition to core B1WebAPI folders, two special folders require write permissions. All folders are listed below. The configured B1WebAPI Temp Directory As configured in the Server Tools B1 Config section. This is used to “stage” files that need to be uploaded into B1’s attachments directory. The SAP Business One Attachments directory Write permissions are required on this folder when using attachments features such as Customer Portal Service Calls (with attachments), Employee Portal Sales User, or Employee Portal Expense User. A list of the folders for WorkFlow Portal and each folder’s purpose is found below. /service/ This folder contains the WorkFlow service executable and configuration files. This must be accessible to the user assigned to the workflow service so the service can be run. /service/logs/ This folder is used for WorkFlow service logging. File permissions must be set so that logs may be updated by the user assigned to the workflow service..
/service/xml/ This folder and sub-folders contain workflow definition files and must be read/write accessible to the user assigned to the workflow service. Browse the website to verify that the Portal is running properly. If not, see our Portal Troubleshooting Guide for common install errors and their resolutions.